This correspondence is the result of, and in reaction to, accusations that Lutheran Churches in the U.S. were loyal to the Kaiser (German Emperor) because most of their congregation consists of German Americans. 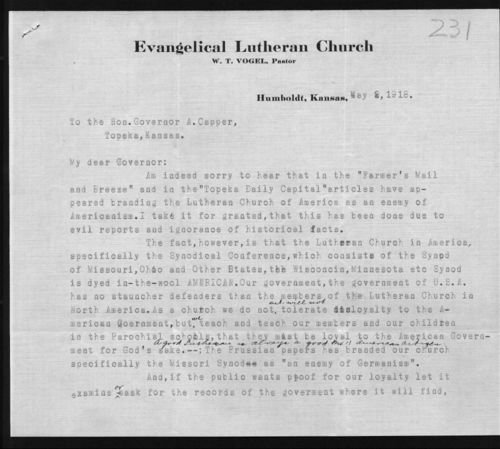 In one piece of the correspondence, Pastor W.T.Vogel of Humboldt, Kansas, writes to Governor Arthur Capper of Topeka, and requests that Capper pass his letter and accompanying newspaper clipping to the Topeka newspapers for distribution. Governor Capper responds by assuring Vogel that he does not doubt the loyalty of members of the Lutheran Church. Correspondence can be used to help students appreciate the difficulties German Americans faced during World War I.